You may think that it’s not easy to plan a holiday in Nepal, but here’s a surprise for you. For Indians, Nepal is easier to reach than Manali. Kathmandu is only 1.5 hours away by air from Delhi and about 2.5-3 hours away from Mumbai. You can literally go door-to-door (including time spent in the airport) in 4 hours from Delhi to Kathmandu. Here’s everything you need to know about planning a weekend holiday in Nepal. First, spend a couple of days in the hustle and bustle of Nepal’s capital. This depends on what you want to do in Kathmandu. If you want to be in the centre of all the action, stay in Thamel. It doesn’t have great views or luxurious hotels. But it definitely gives you the best bars, clubs and restaurants in Kathmandu at walking distance. Check Airbnb and OYO for references on places to stay in Thamel. Most hotels or hostels will only be a short walk away from the recommended places to shop and eat. If you want to be away from the noise but still nearby, you can pick a hotel near Narayanhiti Palace or Durbar Square. These areas are slightly quieter and less congested than Thamel. And they’re not too far from each other. There are rows and rows of bars and clubs in this area. If you can, start your trip on a Thursday. The party nights here are Thursday and Friday, so you’re in for an entire night of fabulous live music and DJ performances. This area is alive till 3am on these nights, so you can enjoy a leisurely dinner and join the party later. If you’re wondering about safety, let us assure you that Kathmandu is much safer than Delhi or Mumbai. Women move around confidently at all times of the day or night and no one gives them a second glance. No one will force you to buy anything or enter a particular place. They will ask you politely once or twice and move on. So ladies, party with your girls without any worries. A pioneer in preserving Nepal’s heritage, The Dwarika’s Hotel is an absolute marvel. This luxury hotel is built with handmade bricks and has woodwork which is centuries old. The hotel describes the property as a living museum, and they are right! The intricate architecture and absolutely stunning surroundings make this hotel ideal for a brunch date. Durbar Square is the main tourist attraction of Kathmandu and houses some spectacular architecture. Most of this area, however, is being restored after the devastating earthquake of April 2015. You can visit the museum which will give you the details of the restoration work and how people are working to make the ancient structures of Nepal stronger. You’ll see the cracks in the buildings and the poles literally holding them up. It’s a sombre experience but it is a must-do in Kathmandu. Thamel houses most of the best restaurants of Kathmandu. If you’re looking for an extravagant meal of steak (yes, you get beef in Nepal) and more, head to New Orleans Cafe. This place offers great ambience and even better food. For a traditional Nepalese meal, go to Himali Kitchen or the other smaller restaurants along the street. While you’re walking around at night, find Purple Haze and settle down there for a drink and really good live music. If you want to continue the party with faster, thumping music, make your way to Reload. The rush of lights and headbanging music is stunning. All this dancing will probably make you hungry again. Kathmandu also has all-night restaurants like VIP Lounge. They have live music till late into the night, great food, and alcohol. Try their fried momos. After Kathmandu, head to the gorgeous lakeside city of Pokhara. You should splurge a bit on your stay in Pokhara because you need a lake view. Hotels here are more expensive than Kathmandu but you can also choose to stay in a hostel. Choose accommodation that’s near the lake and the main market. Here is where you’ll find the best restaurants, shops and bars on a beautiful street. Honestly, this is one of the best treats you can give yourself. Just sit by the lake and watch the gliding waters surrounded by mountains. It’s magnificent. Stop and stare at the view because it is one of the best sights in this part of the world. Once you’re done admiring the view, get ready for an adventure. Go paragliding in Pokhara and glide like a bird over the lake and mountains, and spot the snow peaks lining the city. The peace you will feel while you’re in the air is unmatched. The takeoff point is high up in the mountains in Sarangkot and you land right next to the Phewa lake. 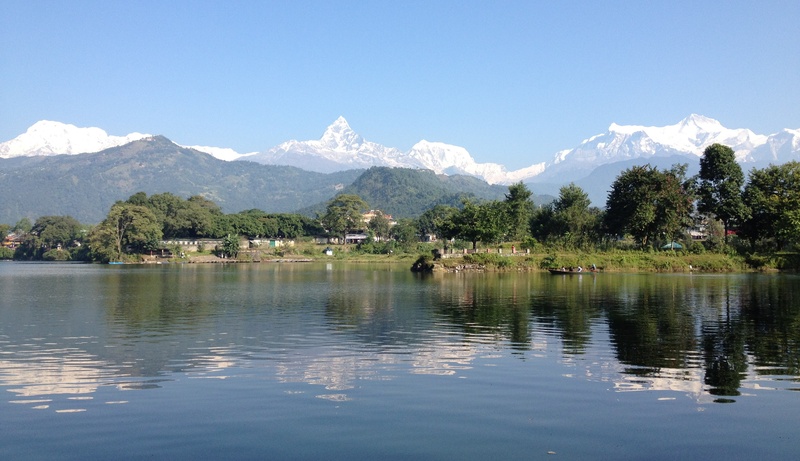 Pokhara is truly an adventure-lover’s paradise. After the peace of paragliding, you should also sign up for the thrill of ziplining. 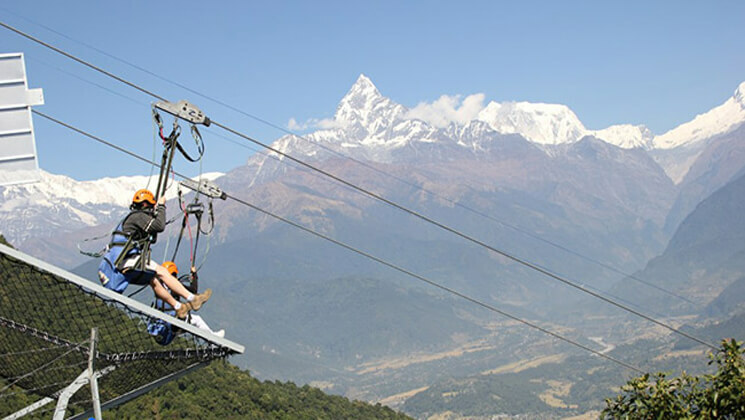 The zipline in Pokhara is considered one of the steepest and longest in the world. The drop is approximately 2,000 feet and the distance you travel on the zipline is about 1.8 kms. The jump point is in Sarangkot, about 40 minutes away from Pokhara. When you get there, you will be securely strapped into your seat and harness. Listen to the instructions carefully and wait for that gate to be thrown open. This gate is the only thing between you and a 2,000-foot drop. Once the gate opens, you will hurtle down the zipline at breakneck speed. The first 5-6 seconds will be pure terror. After that, it’s just the wind, the mountains, and you. When you reach the landing point of the zipline, you can also go bungee jumping. The jump point is right there and you will be made to land into a waiting boat below. Walk along the lakeside market and you will find something you love. From succulent steaks, juicy momos, oven-fresh pizzas, to traditional Nepalese food, there’s something for everyone on this street. If you want great ambience with good starters, head to Roadhouse Cafe. The decor of this restaurant is quite unique, and their use of fairy lights is adorable. For cocktails and dancing, head to Busy Bee Cafe. This is one of the most popular restaurants in the city so you should go there early if you want a table. While you can get live music in a lot of places, there are some that really stand out, like Dunga. They have a beautiful space, inside and outside, and have great food. Try their momos for sure. When you’re flying to Kathmandu, request for a seat on the left of the plane. About 30 minutes before landing, look out your window and you will know why. The road journey from Kathmandu to Pokhara takes about 6-7 hours. If you can, take a flight. Flying time is only 25 minutes but don’t think that you’ll be able to catch a nap on this journey. Get a window seat on the right of the plane and enjoy the jaw-dropping view of the snowy Himalayas. The airports in Kathmandu and Pokhara are small and basic. So don’t rely on them for meals between flights or adequate resting areas. Like every other city in the mountains, the sun in Pokhara is sharp! Remember to use sunscreen and adequate protection when you’re outside. While the air in Pokhara is refreshingly clean, Kathmandu can be dusty. Please take precautions if you’re sensitive to dust or have other allergies. You can use Indian currency in Nepal, but only INR 100 notes and below. Make sure you know the exchange rate before paying in Indian rupees. The current rate is 1 NPR = 0.62 INR. Some restaurants will take INR 2,000 notes but don’t rely on it. Don’t rely on using your credit or debit cards in Nepal. If you look at your card, you will see “Not valid for payment in Nepal and Bhutan.” This is because Indian banks can’t help you if there is any misuse of your card in these countries. While you can use your card at ATMs and reputed restaurants and shops, we advise you to use cash wherever you can. You can find cabs at all the popular spots and markets. But you may need to negotiate with them. Take a local with you, if you know anyone, or ask your hotel or hostel manager to negotiate for you. The people in Nepal are quite helpful so it won’t be a problem. Your holiday in Nepal won’t end with boarding the flight back. The stunning view of the Himalayas travels with you for the first 30 minutes or so of your flight. Look out your window and enjoy a magnificent display of nature.